Until now, all the Android Wear watches you could buy were made by technology firms moonlighting as watchmakers, but now there's the Fossil Q Founder. This is the first widely available Android Wear smart watch designed by a company that makes regular watches. 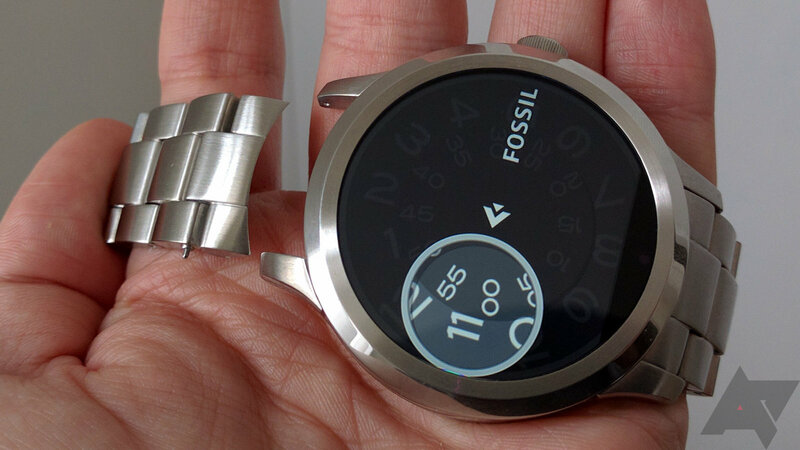 In some ways it looks more like a real watch than any of the others, but there are also some design concessions that remind you Fossil is new to the whole wearables thing. Design It's a genuinely attractive piece of hardware that looks like a real watch. The fit is surprisingly good for being so large. Band If you like metal watch bands, the Q Founder has a great one. It also works with standard 22mm replacement bands. It's a bit bulky, though. Performance The Intel chip seems pretty snappy. There's no discernable lag on the Q Founder. Charging Supports Qi wireless charging, so you can juice it up on third-party pads. Battery life The Q Founder isn't getting the claimed 24 hour usage for me. It's more like 16-17 hours, which is only barely acceptable for a new watch. It also stops charging short of 100%. Display It's another flat tire. It's okay for me, but I know some people will consider this a deal breaker. Performance again I'm seeing real stability and reliability issues with the Q Founder. 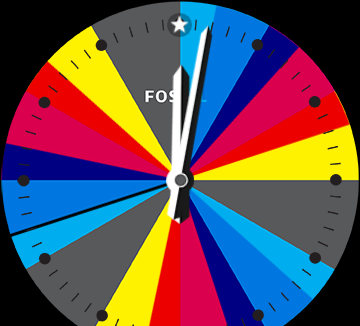 Several crashes and watch face freezes in my testing. Watch faces Fossil really didn't put enough effort into designing watch faces for Android Wear. This is where the Founder could have set itself apart, and it doesn't. Fossil app It's pretty much worthless. Heart rate sensor There isn't one. Size It's a big watch, and there's no smaller option. This is really only a con if you've got small-ish wrists. The Fossil Q Founder shares a lot of design DNA with the company's non-smart watches. It has a stainless steel case and chamfered edge around the display. The lugs stand off from the body of the watch and are actually part of a second bottom section of the watch that attaches to the main housing. 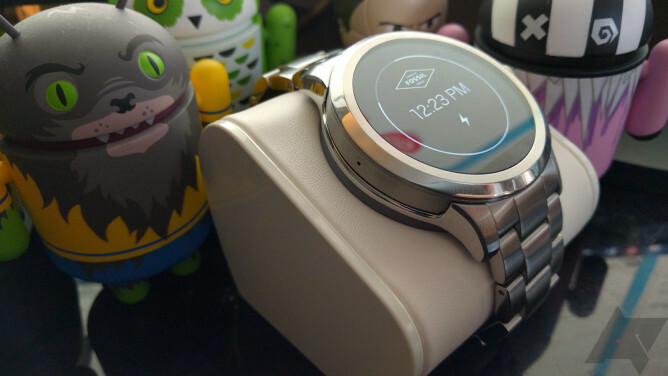 Overall, I think the Q Founder has a very nice look with a bit more style than the Moto 360 or Huawei Watch. If you look at those other watches, they have very minimalist design—which is fine, don't get me wrong. However, it seems apparent to me that both companies stuck with the cleaner unibody look to avoid making any mistakes by embellishing the body in a bizarre way. The shape of the Q Founder is more complex and attractive. The version I have for review came with a metal band, which is of very good quality compared to the one that comes with the more expensive Huawei Watch. I'm not terribly fond of metal bands personally, but the Q Founder has a standard 22mm band attachment and quick release spring bar. That's great, but I was only more impressed with the design when I took the stock band off. 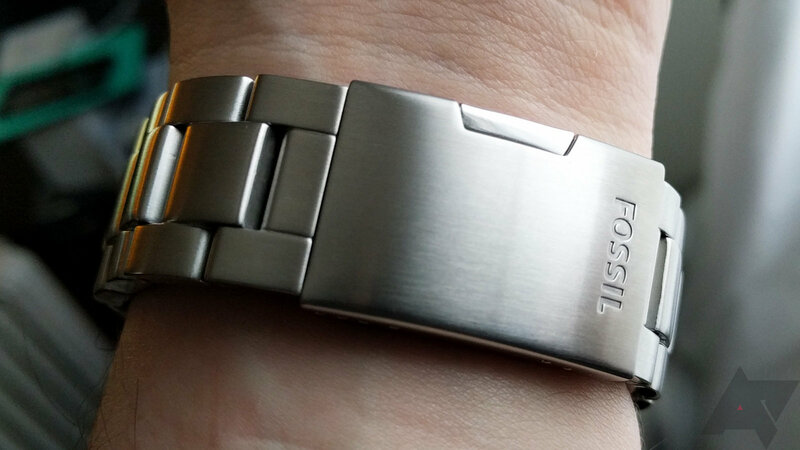 While the lugs are completely standard, Fossil's metal band has curved spacers at the connection point that sit right at the body of the watch to fill in the gap between it and the lugs. It gives the watch a more monolithic, premium look. There's also a solid button-release deployant clasp. If you like metal bands, this is the best implementation I've seen on a smart watch. Metal band removal and replacement leather band. Again, standard bands of all types work just fine. I slapped a regular leather band on the watch and it fits well (the heavy metal band is really only good for larger wrists). 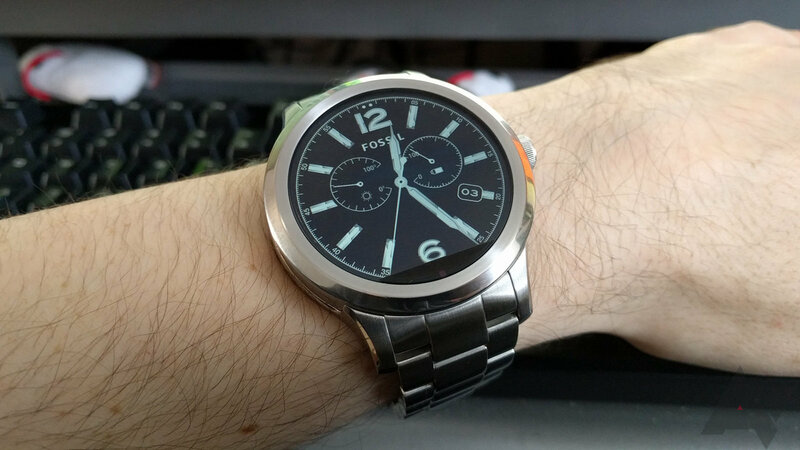 That's good seeing as it's a larger watch than the small 2nd gen Moto 360, which is my favorite one as far as fit. The lugs extend downward from the body of the watch, allowing the band to connect closer to your wrist. This is good for those of us that have smaller wrists, but it's still a big watch. The screen on the Q Founder is 1.5-inches across, but I'll talk about that in more detail later. Most of the Q Founder is metal, except for the underside. 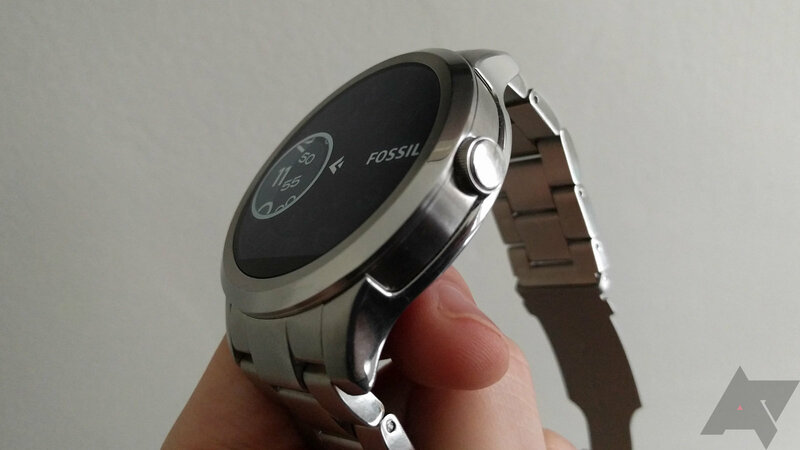 This isn't uncommon for smart watches, but there's something missing on the Fossil watch—there's no heart rate sensor. It's just a flat piece of matte plastic, which strikes me as a little weird. Some other watches lack a heart rate sensor, but at $300 for the Founder, I would have expected this basic feature. There's a single button on the side of the Q Founder right at the 3 o'clock position. Motorola and Huawei placed the button at 2 o'clock so it doesn't rub against the wrist. This is a small concern with the Founder, but it hasn't bothered me too much. The button itself is great. Just the center part of the crown is the button with a solid piece of metal surrounding it. There's a nice tactile bump and a good amount of travel when you press it. It's like a softer version of the Moto 360's very clicky button (keyboard analogy: it's like the difference between Cherry MX Blues and Browns*). There are a few interesting things going on inside the Q Founder as well. This is the first watch to be released with an Intel SoC. The actual chip isn't listed in the specs, but according to a system info app, it's a 22nm Merrifield Atom chip with two cores clocked at 500MHz. I assume this is a tweaked version of the Z3460. It also has 1GB of RAM, whereas most (possibly all) Android Wear devices have 512MB. 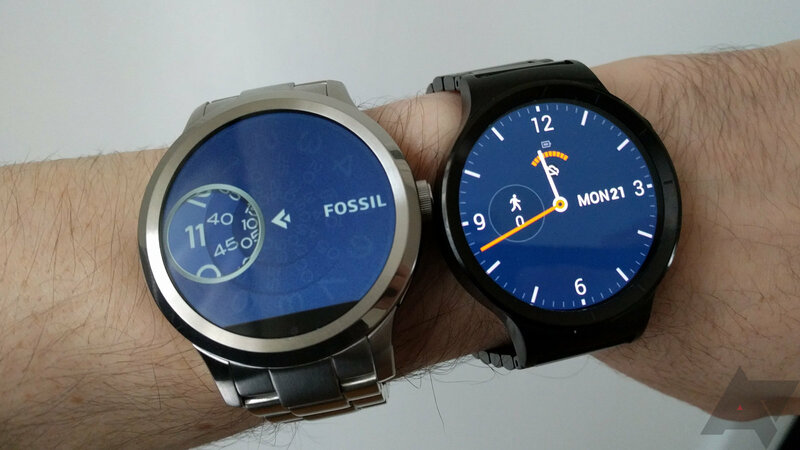 Motorola has been criticized for sticking with the flat tire LCD on this year's 360, and Fossil is doing much the same thing with its debut Android Wear device. The 1.5-inch diameter LCD has a strip missing at the very bottom where the display connectors are. This is also a convenient spot for the ambient light sensor, which is still a rarity on watches. Bonus points to Fossil for working it in. I'm not happy with the flat tire when there are watches with completely round AMOLED panels. I almost want to give Fossil a pass because it's a watch company getting into a new market, but just on the merits of the product, the flat tire is a con. It's true what they say—you get used to a flat tire screen after a while, but there are still times you apply a new watch face and it's cut off in a really obnoxious way. You'll notice then. The resolution is 360 x 326, which is about the same as the larger Moto 360 (360x330) and lower than the Huawei Watch (400x400). The display looks sharp enough and gets very bright for use outdoors. It's more readable than the Huawei Watch outside, but still far short of the Sony watch with its transflective screen. While the screen will remind you of the Moto 360, it does have one significant leg up on Motorola's device. The Q Founder does not go into low resolution mode when it's asleep. That means you can use watch faces with sharp lines and even colors without them looking busted. Motorola and a few other OEMs do this to save power, but I think most people would trade the modest savings for an ambient mode that looks better. That's what you get with the Q Founder. There aren't many Android Wear devices that can reliably hit two days of use, so you're pretty much always going to be charging your wearable every night. As long as a watch can make it a full day, I consider that acceptable. Anything more is just gravy. 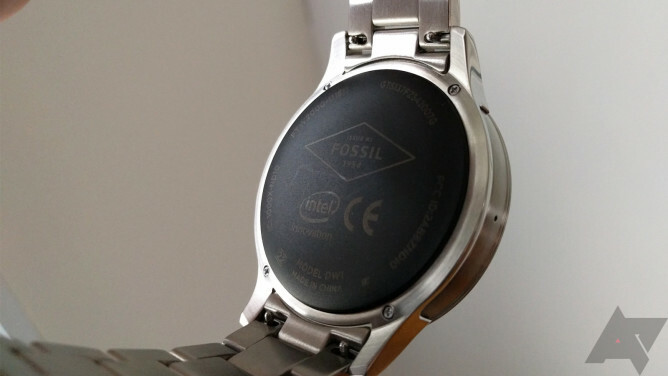 Google and Fossil claim the Q Founder and its 400mAh battery will last for a day and then some. My experience with the Q Founder hasn't been quite that good. I've been seeing 16-17 hours of battery life with what I would consider moderate usage. I have all the motion features turned on, ambient display, and a few email accounts syncing. So, despite having a larger battery than the small Moto 360, the battery life isn't as good. That watch gets a solid 24 hours of life. The Huawei watch with its slightly larger battery manages a few more hours on average. The Q Founder just isn't up to par yet. Maybe with a few updates they'll sort things out with the Intel chip to make it last longer, but right now it's not great. It's just as likely that the battery will perform worse in a few months, and at that point I think you'll have trouble getting through the day. The charger that comes with the Q Founder is massive and kind of ugly. When I took the watch out of the box, I didn't know where the charger was at first. Turns out it's the cushioned plastic insert that holds the watch upright in the box. It's finicky and you have to lift the dock up to slip the watch band around it to line up the coils. There's a charging LED to help you know when it's aligned properly, but it's under the watch, making it hard to see unless you are looking from the correct angle (the charging screen doesn't show up reliably). The watch also seems to have issues reaching 100% on the stock charger. It usually stops charging at about 95-97%. One pleasant surprise is that the wireless charging is a standard Qi system. That means you can use third-party charging pads with the watch, and I think you're going to want to. Really, this is one of the worst stock chargers of any watch. OEMs don't have many opportunities to differentiate themselves on Android Wear, so what few chances they have must be capitalized upon. 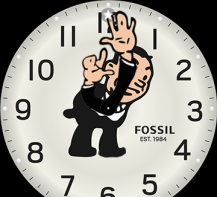 Fossil, to my dismay, has not done that very well. This watch is running the Lollipop version of Wear out of the box, so most everything that we've said about the OS in the past applies to this one. It's the little things that Fossil seems to be struggling with. 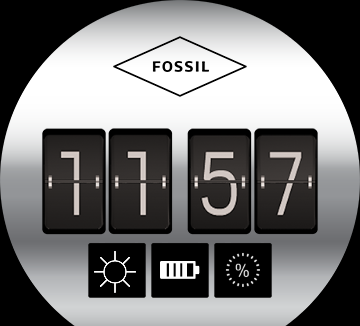 Having designed plenty of mechanical watch faces that look nice, I hoped Fossil would have really gone all out to make the watch face experience great. 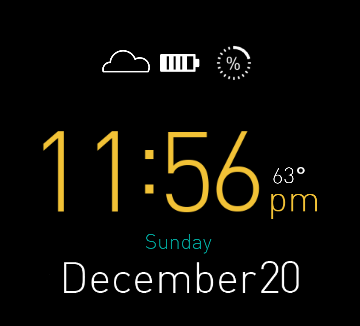 Instead, the included watch faces are boring and limited. 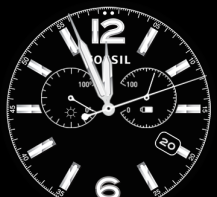 There are six exclusive Fossil watch faces, but there are consistent implementation problems in them. 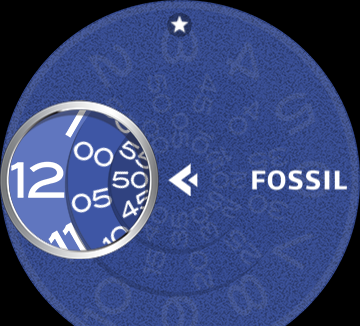 For example, Fossil's complications (the extra data displays on the faces) are not very well thought out. 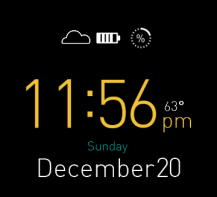 Example: a few of the watch faces have a battery gauge, but there's no digit. It's just a tiny battery icon that empties as the battery drains. It's so small that there's not enough resolution to tell you much about the battery level. Similarly, there's a weather icon that's just an icon representing current conditions—no temperature. The Classic watch face is probably the best (that's the one in the hero image up top), but even it has weird issues. The weather display is a dial, but it's tiny and all I can really tell is that the temperature is somewhere between 0 and 100... so thanks, Fossil? The layout also ignores that this watch has a flat tire LCD, thus the "6" is cut off at the bottom. It wouldn't have taken much to change that and not call attention to the missing pixels. There's a Fossil app in the Play Store that adds a bit more configuration to the watch faces, but it's otherwise not very useful. It includes fitness tracking features for Fossil's other Q devices, most of which are not supported on the Founder. It also runs a persistent notification on the phone for some reason I cannot fathom. Even without the app, Fossil's watch faces have a few useful settings on the watch for things like background and number styling. This is one thing Fossil got right. I feel very torn about the performance issue with this watch. On one hand, it's smooth and extremely responsive. Even the gesture scroll feature that can be sluggish on a lot of watches is lightning fast here. 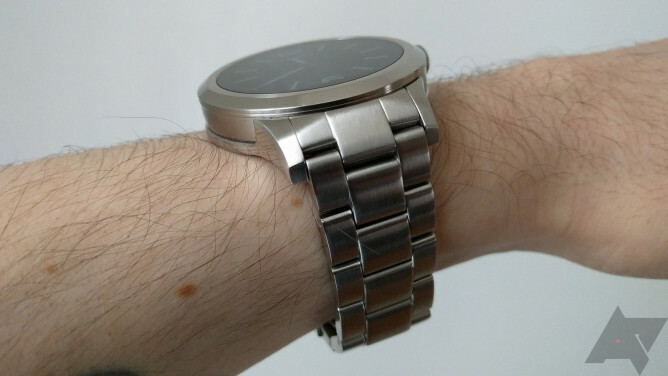 On the other hand, the Q Founder is also the buggiest Android Wear device I've used recently. The stock watch faces have frozen 3-4 times, and the entire watch has flat out crashed a couple times. It just hasn't been an awesome experience. I got a second unit to make sure the first one wasn't just a dud, and it seems slightly better. It's still frozen a few times, though. The Q Founder is an interesting device. 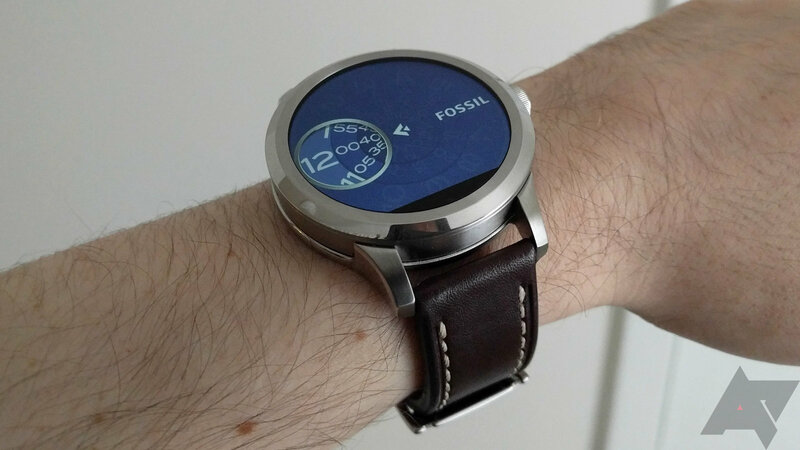 Fossil's industrial design is slick and refined compared to most other smart watches. Even though the Q Founder is larger than devices like the Huawei Watch, it still fits pretty well. The metal band is very high quality and I really like the way it fills in space between the lugs, but allows for a more open look with a leather band. It's probably too bulky with a metal strap for those with small wrists, though. The screen looks nice, but there is that flat tire to contend with. It's lame that we're still putting up with this design quirk, but on the upside you get an ambient light sensor. So, I guess it's not all bad. You're either willing to tolerate this or you despise it. Fossil dropped the ball with the software. The few exclusive faces included with this watch are mostly boring with strange design decisions, and the companion app is almost useless. The watch itself also has some bugs that need to be worked out. I don't expect a smart watch to necessarily be as stable as a mechanical one, but when I have to reboot because the time froze 30 minutes ago, that's a problem. The reboots certainly don't help the battery life, which is mediocre right now. If it gets any worse as the watch ages, then you'd probably have trouble making it through a full day away from the charger. The saving grace is Qi compatibility, so you can use a charger other than the lame stock one. The Fossil Q Founder starts at $275 for the leather version (which you can't buy yet) and $295 for the stainless steel one. These are competitive prices when you look at the hardware and specs. I suspect Intel is giving Fossil a sweet deal on the SoC in order to get its name out there. It does the same thing with other Android devices. This isn't an awful watch, it's just not as good at the Huawei Watch or Moto 360 v2. I'd suggest you spend a few bucks more to get one of those. If a future software update fixes the issues with this watch, it might be a great purchase. Until then, I'm going to go with "no." *Hey, David gets to make car metaphors. I'm going to make keyboard switch metaphors.